We count things. We measure everything. We pay close attention to the tiny details, attach meaning to it, and then make it an everyday thing in our lives. This is what we do. But it’s not necessarily what’s important to us. Today, I welcome you to pay more attention to the things that really count, but aren’t usually counted. Today, I challenge you to pay less attention to your net worth, your raise that’s overdue, or the amount of money you’ve planned on spending later. Instead of the routine, invest your energy in the number of smiles you get, or the ones you give away. Appreciate the good morning you received. It means a lot. Take in the hugs you’ll receive from a child, a loved one, or a person you haven’t seen in a long time. Put your mobile devices down for a second and make it a priority to look up and admire all that has been provided for you. Marvel at that perfect sky, the colorful flowers and the tree line that has been manicured by its Creator. Don’t pass up the opportunity to appreciate someone in your path. Congratulate a co-worker for a job well done. Extend a warm greeting to the person serving you a meal today. Learn something new about a friend. Just do it. Wink at the things that you don’t normally pay attention to. 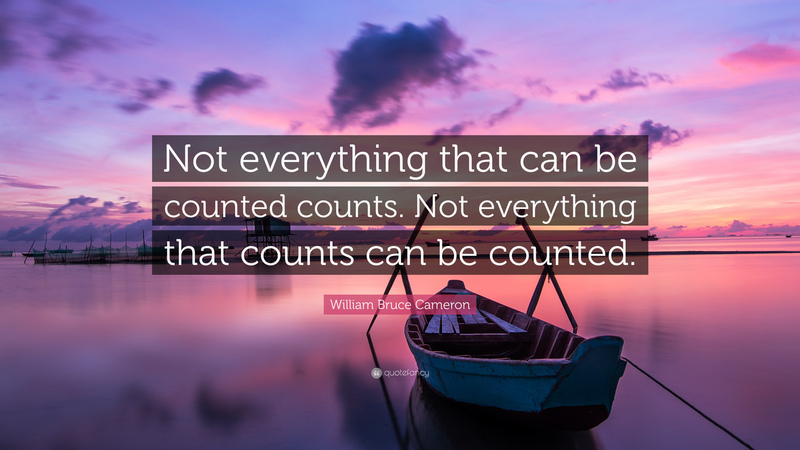 Remember, not everything that can be counted, actually counts, and not everything that counts can be counted. Next Post Happy Mother’s Day to Us!